The house under construction this past summer. It’s pretty easy to see that there are a lot of folks that quite simply, well…want to live more simple! They want to downsize, reduce their stress levels, have less or zero debt, eat better, and have more time to enjoy life. One of the biggest hindrances to living a more simple life is a home that is too big, too cluttered, or a combination of both. It not only costs more to build or buy a larger home, but also to maintain it. And that cost is both in time and money! For us, it made complete sense to downsize to a home that had only the space we truly needed. And that is exactly what we tried to accomplish with the Simple House Project. No, we weren’t looking to move to a tiny house. It just wasn’t reasonable for us. Nor is it for most people. In addition, I am always shocked when I see the cost of one of those 200 square foot trailers approaching $50,000 to $70,000.00 or sometimes more! That is a tremendous amount of money to spend for 200 square feet. We opted instead to build what we termed a “Reasonable Home”. At the time, we still lived in our suburban home, with nothing more than the dream of downsizing. We had 3500 square feet in total. That included a never used living room, a once-a-year used dining room, and unused bedroom and basement space. Of course, we had to maintain, heat, and furnish it all. Our goals for the Simple House Project were straightforward. (1) create a home with only the space we needed to be comfortable. (2) Use multiple energy-efficient and cost-effective building methods. (3) To build as much of it as possible ourselves. (4) To share the entire process on the blog to help others looking to do the same. Eliminating unneeded rooms. The floor plan for the Simple House. Fast forward 431 days later, and much has changed! During that short time – we sold our old house in the city. We went from living in a house with way too much space, to building and living in our 1054 square foot dream home at the farm. So what did it cost? Did it really make our life less hectic? And did it save money in the long run? Well, the cost portion is covered below. But to answer the last two questions, it has been nothing short of amazing. We certainly don’t miss the space. We love living at the farm, and it has saved on our budget and time enormously. First, a bit of a disclaimer. We realize you can build an identical home in a hundred different areas and come up with a 100 different costs. In addition, everyone will have different tastes and methods of construction. With that said, hopefully, at the least, this can be a good reference for others looking to do the same. We included notes in each section for what we did on our own vs. hiring. Obviously, the more you can do yourself, the more you are going to save. 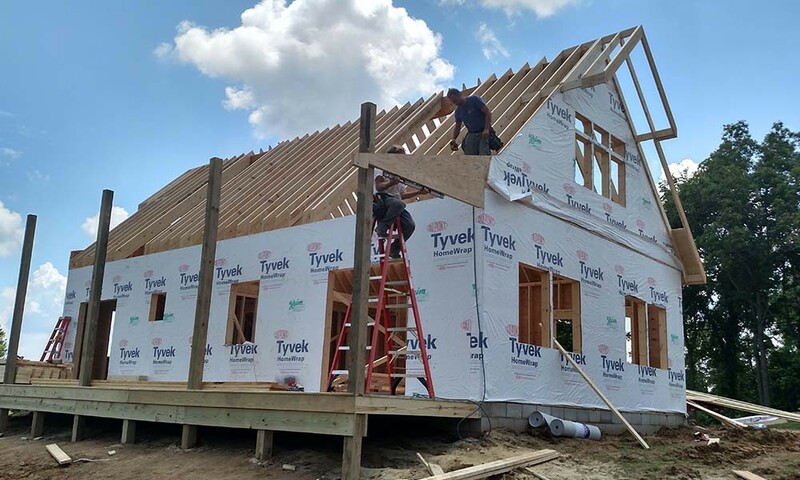 When we started, our goal was to see if we could build a house that would meet all of our needs, now and into the future, for somewhere between $100,000 and $125,000.00. We knew to accomplish that, we would have to be willing to do a lot of the work ourselves. Sweat equity is an amazing way to keep a house construction budget in check. The key is doing absolutely everything you can and are able to, and leaving the things you can’t in the hands of great professionals. In that aspect, we were very fortunate to work with incredible professionals. Although we have many projects in the future for the home, the costs below represent the overall majority of the final budget. If you know us, you know that we will never be “done”. We simply love projects too much! Besides, we always need material for the blog. 🙂 As for our goal, as crazy as it sounds – we ended up right smack in the middle. Not too bad a for a pair of rookies. DIY insulation saved a ton on the overall budget! 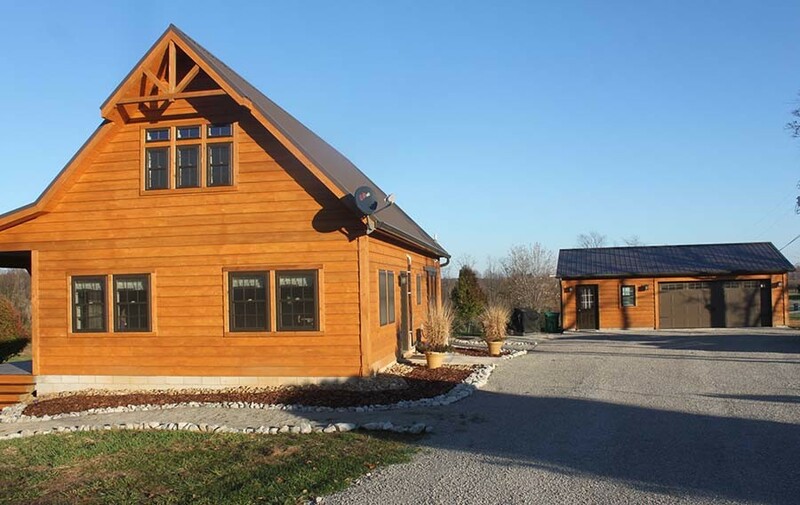 Complete Exterior House Shell – (Includes roof, siding, doors, windows, etc) We had the entire shell of our house completed for us by Weaver Barns. If we had to have a single word to describe Weaver and the quality of our house, it would be: SENSATIONAL. Plumbing – $3800.00 : We were fortunate to have a great plumber – and he was so helpful in setting us up with the floor heat system. With such a small house and all of the pipes located in one-quarter of the house – plumbing costs were extremely reasonable. *One extra note on the heating system. It has been incredibly energy-efficient to operate, and has saved tremendously on heating bills. Our gas bill in the middle of the winter is around $100. That is heating, water and gas cooking. 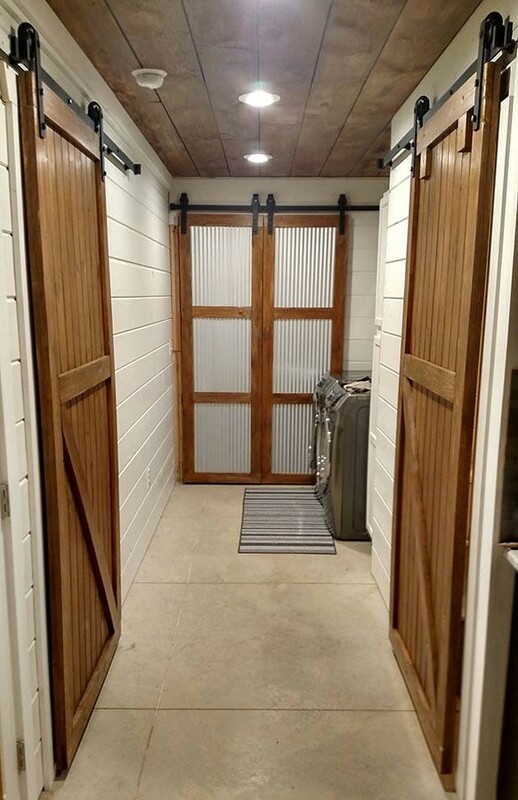 Saving on the Simple House Construction Budget – building your own barn doors. Thank you so much for putting this cost break-down together! My husband and I love it! What about your land, did you already have that bought, or did I miss that as part of the budget? Congratulations on your new home! I will be pinning this article for future reference. In the next year or two we will be building a small home on our farm for my mother-in-law. Very interested in the foundation, heating and A/C, walls and ceiling finishes. 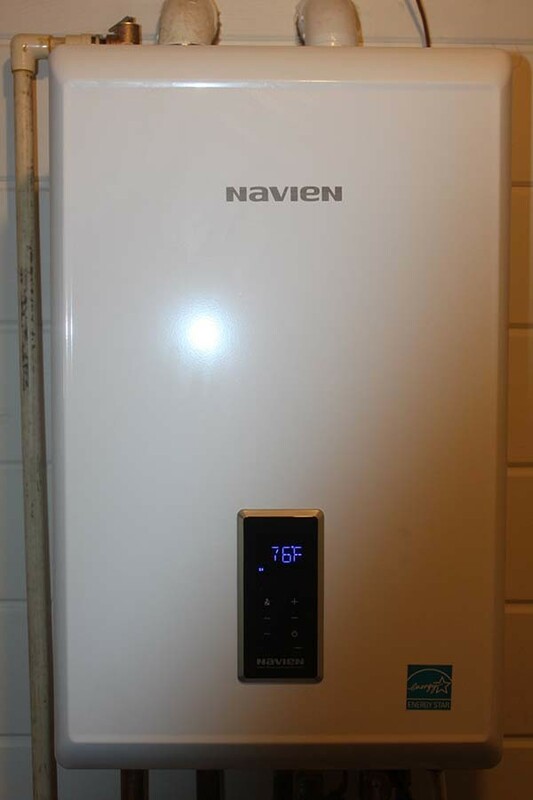 We have a tankless water heater in our home and LOVE it! Boy did it come in handy with three teenage daughters! Thank you for sharing. A question about the ductless ac: how well does it cool your bedroom? Does the cool air reach the “nooks and crannies”? My husband likes to sleep in “arctic” conditions even in the Alabama summertime! We are looking into living in a single story similar to yours and would love to avoid ducts. Our current home is 55 years old and the duct work needs replacing. Ever since you posted about using the galvanized steel as a wall covering I have kept it in mind for my new shop ceiling. However, I have not been able to find sheets of this at any savings over drywall. Where did you find this or who was your supplier? I have been addicted to your posts and videos of your home building process! I have been toying with the idea of a metal building/ pole barn house where the walls inside are not weight bearing so they can be arranged in any way. Love the idea of a loft with a few extra bedrooms for when family visits because we all live in different states so staying overnight will be necessary. I can’t wait for a finished video tour! Thank you so much for taking the time to share your journey with us! It sounds like you have a great plan in place and a lot already completed! It is funny, we will be doing an article on the kitchen island diy project in a few weeks. If you email us at thefarm@owgarden.com – I can send you a few pics of it. Cand, so glad you brought that up. We had heard that same thing before building, but the whole house systems have really come a long way in the last few years. Some of the individual systems do have issues – but this whole house tankless heats really well, no matter the outside temps. Ours heats water up to 155 degrees at a constant temp all through the house, and we have already had a few days at or below zero this year. Thanks again for the gardening sweet potato article for This Is My Garden – such a helpful article on how to grow them! We love to hear about people building what they need – and not what others think they need! You are so right, the needs everywhere are different – and the important thing is to build to what your needs are. Sounds like you have it going along perfectly! Good luck on the your house project! lol – no worries Greg. We always seem to hit send before we are done too! TO answer your questions. We had the well dug and then the water tested to make sure all was good. We are very fortunate in this more rural part of Ohio to have good water quality.So glad you have enjoyed the series and wish you the best as well! Always love hearing from other countries! I have been following your blog as I have plans to move from a 1400 SF home in a small city, where I have about 10 feet on each side of my home before I encounter neighbors, to a 20 acre parcel of property in the country. I have owned the property for 14 years and have put in my well which is 290 feet deep and cost $13K. Our septic is in as well as underground electricity. To make this possible, I opted to purchase an 800 SF single wide manufactured home with a very open floor plan. I have been working at downsizing, but would really like to add a kitchen island for extra counter space, a little storage and a place to sit for two people so I don’t need to take up room with table and chairs. Can you please share what your kitchen island looks like? I tried searching for a picture but couldn’t seem to find one. Thank you for your blog and excellent information and for the incentive to pursue your dreams. I had a house in San Antonio with a garage conversion. When company came, everyone would sit in the kitchen or outside on the patio. We don’t own a TV so there was no use for a living room. We are slowly building our house in West Texas. Although the house will be about 1500 square feet, there is no living room. My Pantry is 20 x 8 feet, because the nearest decent grocery store is 100 miles away. My nearest neighbor is 5 miles away. The needs here are different than in a city. I do have a large kitchen. Damn – hit send too early. The reason that I asked about the water purity was that when I was in OH 4/5 years back, the Maumee and St Josephs rivers looked not too clean and there was a warning not to eat what you caught in the Maumee near Defiance … made me wonder. Yes, I saw the 250 feet in the article but assumed that the Ohio water table must be quite low! When you first pumped water, did you have it analysed to see what it actually contained before using? Our water here is very hard (mains) but I actually like the mineral laden taste – the kettle and shower head are not so keen though! Limescale at every turn. The very best to you both from a rather rainy and cold Andover. 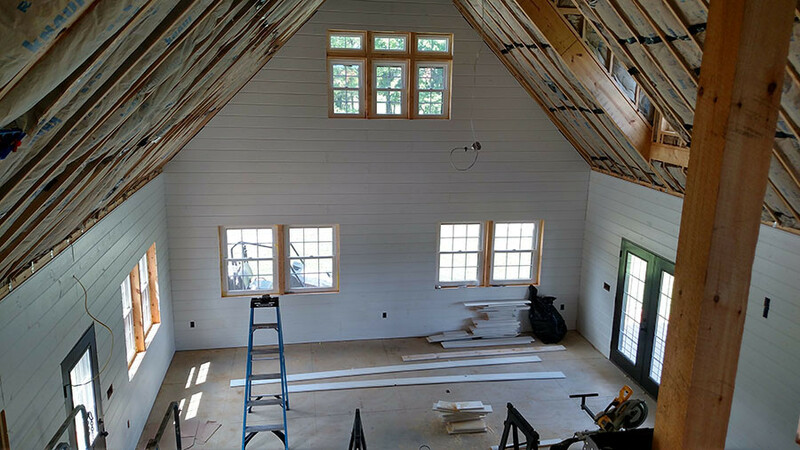 Thank you for this post re: costs, also keeping this post re: drywall vs shiplap right on! And the AC and tankless water. I am curious about the well; what do you have to do to the water before it is safe to drink? Or do you just buy bottled water for that?? In the main, the house looks extremely good and although I have not added up the costs, I would imagine that it is very reasonable. Unfortunately, land in the UK is so damned expensive that such a venture would be impossible, but maybe NZ would provide a similar possibility. I dunno. At 60 I may be too old to start building! Best wishes from an avid, and sometimes critical, reader.